May 1st is the National Day of Prayer. Since 1988, by law the first Thursday in May has been set aside for national prayer, reflection and repentance. Presidents Ronald Reagan, George H.W. 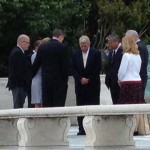 Bush and George W. Bush officially participated and held events for the National Day of Prayer. Presidents Bill Clinton and Barack Obama did not. As our nation struggles with continued economic insecurity, vast healthcare change, and continual challenges to basic constitutional rights, citizens of the United States are preparing to exercise one of their most precious freedoms — the right to gather, worship, and pray to God. Following in the footsteps of our nation’s founders, who fought for religious freedom, millions will assemble at thousands of local National Day of Prayer events across America, where they will take time out of their daily schedules to intercede on behalf of their communities, their nation, and their leaders.